Olympus has introduced an affordable ultrazoom (20x wide zoom lens 26-520mm) digital camera, i.e. Olympus SP-565 UZ, that allows Zoom in ultra-close or back out for an ultra-wide shot with a single lens. The ultra-zoom camera allows you to bring yourself right into the heart of the action, such as capture the excitement of a football match from the sidelines. It is possible to using the 5x digital zoom and optional TCON-17 Teleconverter (with CLA-10 Conversion Lens Adapter). The integration of Dual Image Stabilization (both mechanical and digital image stabiliser) gives the end result to be reliably sharp. The 10 megapixel SP-565 UZ also provides user with flexibility for wide-angle shooting, such as capturing sweeping landscapes, group photos and interiors or other architecture. The camera also features sequential shooting at up to 13.5fps allows every facet of a scene to be recorded. The ingenious Pre-Capture mode records pictures even before the shutter is fully pressed. Pre-Capture Movie mode is also available that provides the same advantage but in movie format. In addition, the Super Macro Mode (as close as 1cm) gives photographers ability to explore a subject’s every detail. SP-565 UZ comes in 23 scene modes covering the most common shooting situations. It also offers manual control (P/A/S/M) options with TruePic III image processor that ensures best results. Advanced Face Detection Technology is able to detect up to 16 faces to ensure human face come out optimally focused and exposed. Shadow Adjustment Technology recognizes dark areas and adjusts accordingly to obtain the most realistic image possible. High ISO settings and BrightCapture Technology enable low light photography. 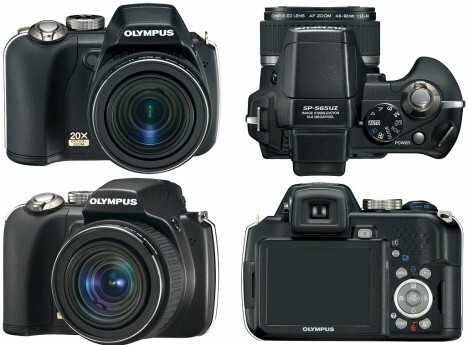 Apart from built-in flash, the camera is compatable with the Olympus FL-50R and FL-36R wireless flash units. In addition to internal memory, the camera supports xD-Picture Cards and microSD Card . The wearers of spectacles will appreciate the viewfinder’s diopter correction facility. The camera will be available in late September 2008 for an RRP of £349.99.